It was 6.30am on a Saturday morning, and there was a heavy fog rolling in from the ocean, engulfing Tancha beach. Yet we moved forward with ambition (At least it's not pouring, I remember remarking). Tania had arrived from UWA the day before, and through some absurd intern voodoo magic had managed to book the OIST car for a full day (a full day! In comparison we were told it was booked out for the entire weekend). 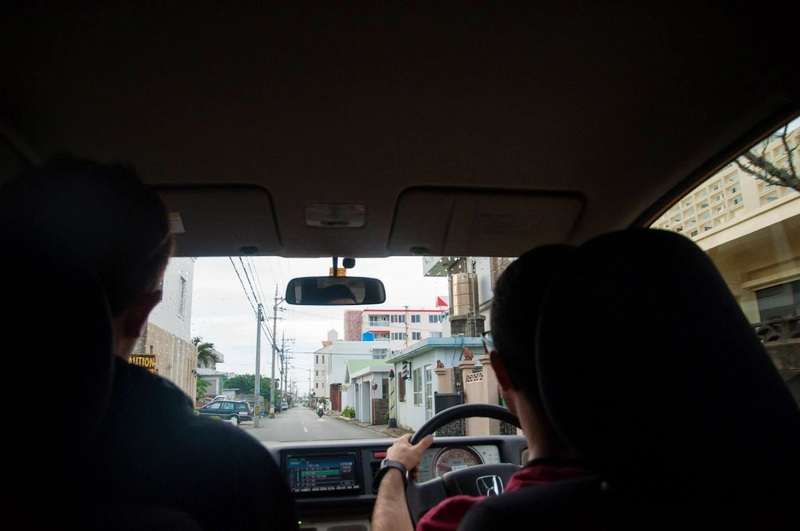 We had the car from 7am to 6.30pm, so the current plan was to go everywhere we could south of OIST, ending up at Naha, the capital of Okinawa-Honto (finally, civilization!). Unfortunately for us, nothing in Okinawa seems to open before 9am. 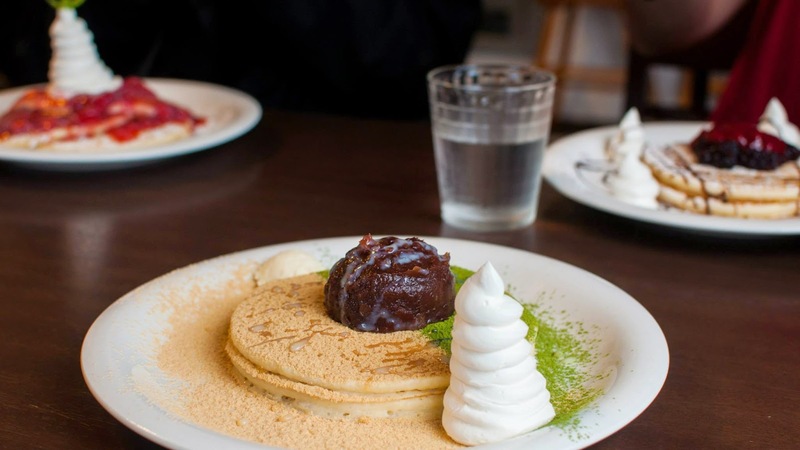 Except for Jakkapoes Pancakes in Toya, The Best Damn American Pancakes This Side of the International Date Line™. 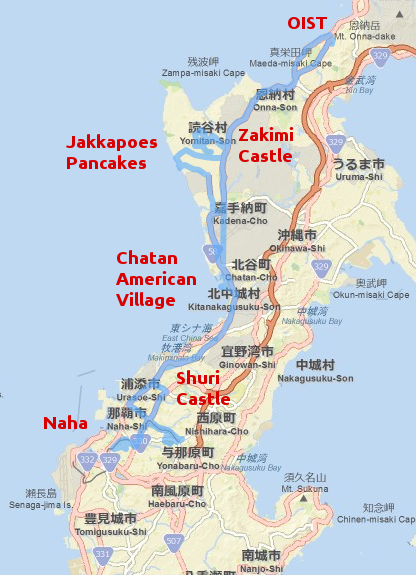 And as much as we wanted to try and stick to local Okinawan cuisine, hey, Okinawa was occupied by the US until 1972 (even going as far as to use the US dollar and drive on the right hand side of the road). 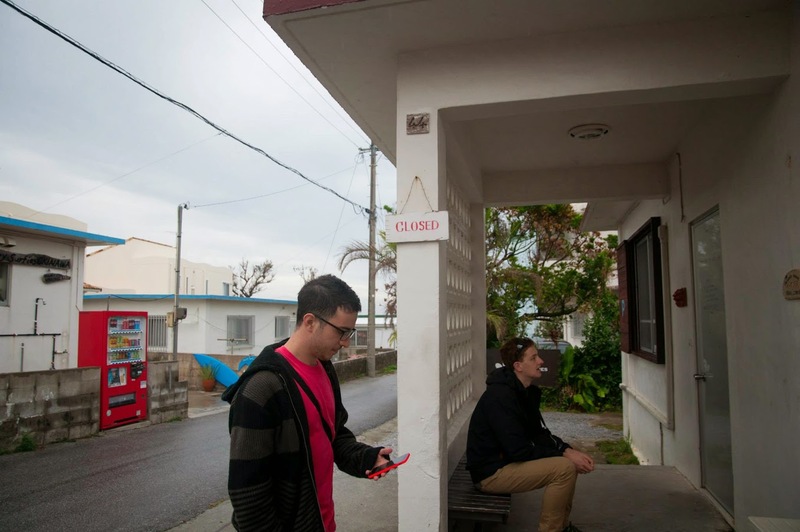 There are still 20,000 American's stationed on Okinawa in fact. So, we figured, American pancakes isn't too much of a stretch (or so we told ourselves). Although it turns out even Jakkapoes doesn't open till 8am. This meant we got to explore the rather picturesque beach right next door. Perfect for our must-photograph-everything-tourist-phase. 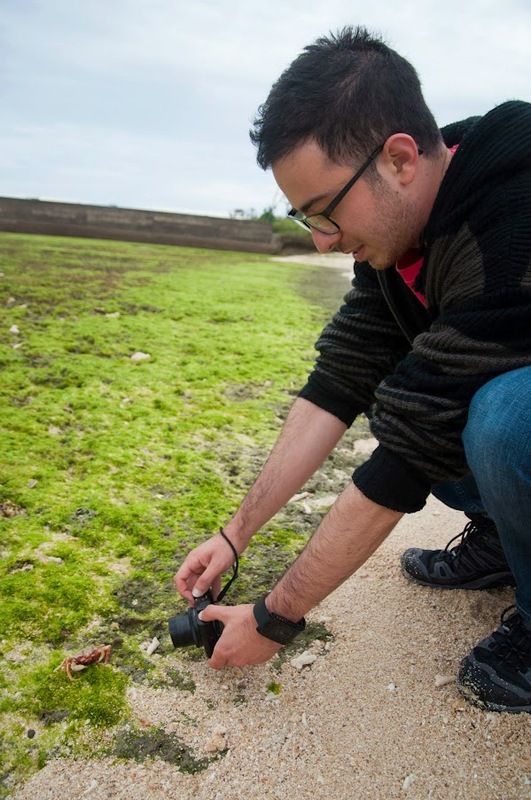 Low tide. The perfect time for pictures! Case in point. Fulfilling our tourist stereotype. Finally, time for breakfast. And Jakkapoes didn't disappoint, with presentation so good we were forced (forced) to whip out our cameras and document it. Funnily enough, the remaining patrons consisted of an American family with kids and US marines. A testament to the quality of the pancakes, yet at the same time a reminder of the American influence on Okinawa. Feeling we needed just a bit more imersion in American culture, we began the drive to our next stop; Chatan, a reasonable sized town in the central Okinawa-Honto. 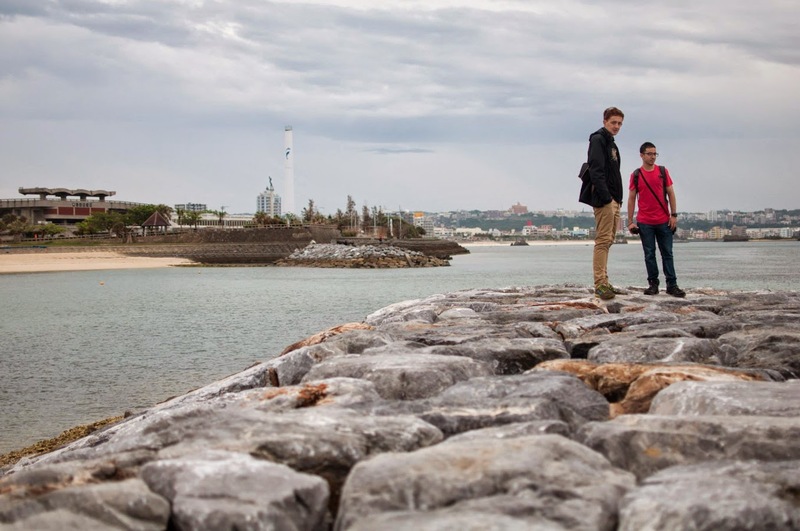 The main attraction: Mihama American Village, a slice of the American broadwalk smack-bang in the middle of Okinawa. It was a pretty surreal change of scenery, however, being 9am, everything was pretty much shut (save Starbucks, where I shamelessly stood outside and stole the free wifi). So after wondering around for a bit, we decided to head back past Toya to Yomitan (30 minutes back the way we came!) to check out the Zakimi castle ruins. Which, being outside, are open 24/7 (finally!). Zakimi castle was actually quite impressive. Built in 1422, and used in World War II as gun emplacement by the Japanese, all that remains of it is its stone walls. Which you can actually walk along, surprisingly enough for a UNESCO heritage listed site. But its location on the top of a hill and the surrounding forest makes it even more spectacular; on a clear day, we were told that you can even see Naha in the distance. It was now 10.30am, and we were rejoicing. Things were open! Stuff to do! Things to see! Food! 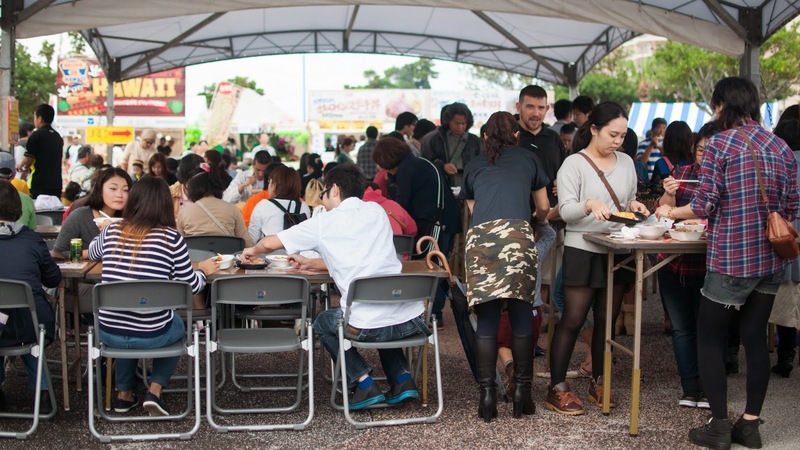 First stop: back to Chatan for the C-1 International Food Battle. I was honestly expecting some sort of Iron Chef-esque event from the name, but I learnt from Tania that it was just a street food style 'battle', in which you purchase food from vendors before voting for who you thought should win (last year, the Indian restaurant Bollywood Dreams was victorious). Okay, slight downgrade from the Iron Chef event I was expecting. 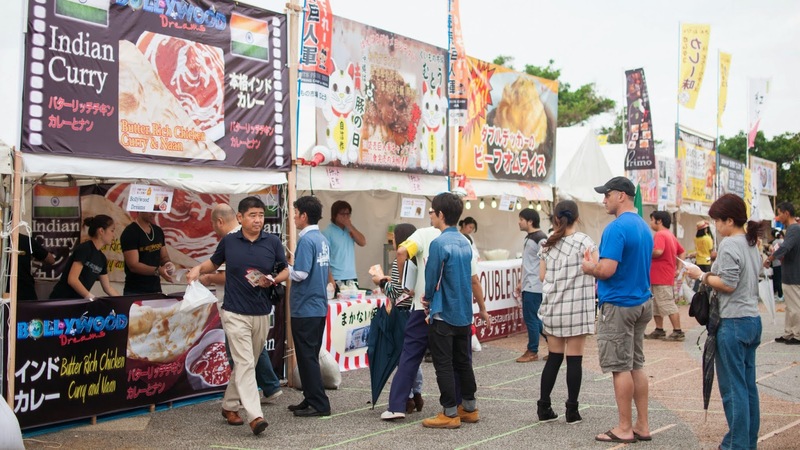 But hey, you can't argue with an international food festival. And although it started to rain half-heartedly just as we arrived, the food was pretty exciting. The food battle. I had number 2 - deliciously tender beef on rice. With chips as well, because why not. Cooking the beef. Perhaps it was Kobe beef, we wondered. Next stop: Naha, and straight on to see Shuri castle, the former royal palace and administrative center of The Kingdom of the Ryūkyūs, before they were annexed by Japan in 1879. 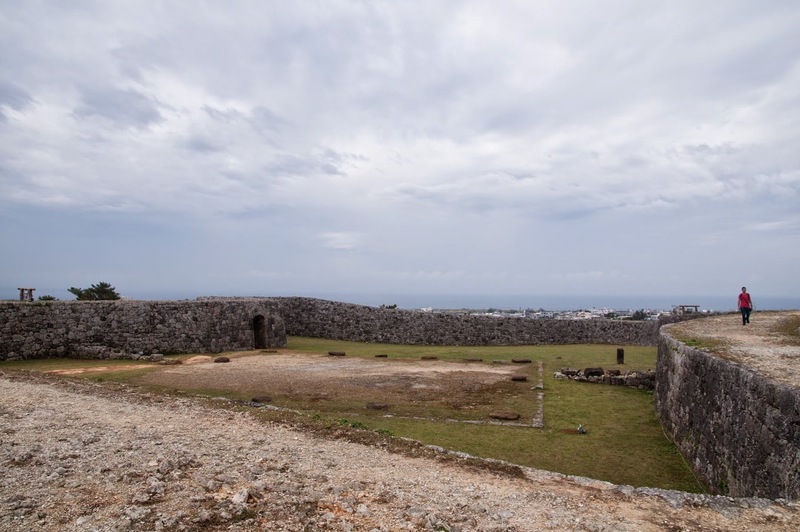 Another UNESCO World Heritage Site, with panoramic views of Naha, Shuri castle was unfortunately destroyed in the 1945 Battle of Okinawa, with the present castle reconstructed in 1992. Although still spectacular to look at, it didn't (at least for me) have the same sense of 'awe' surrounding it that I felt at Zakimi castle. 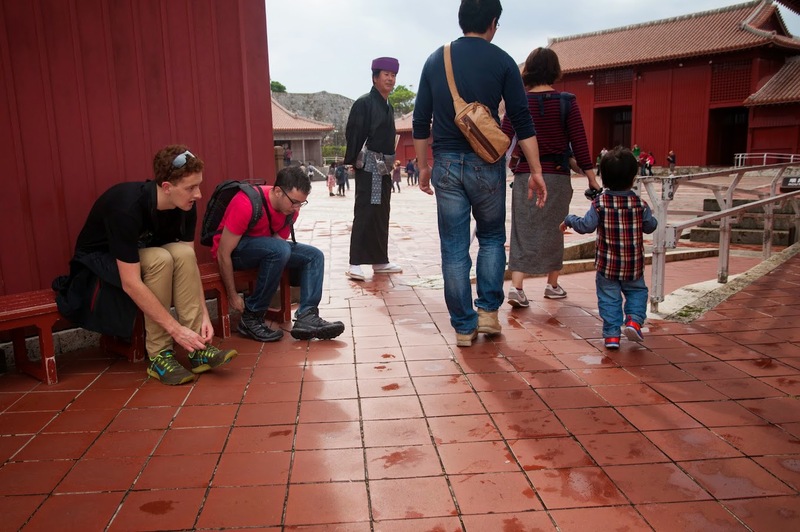 Perhaps it was the high density of tourists, the sense of poignancy surrounding all the missing cultural and historical artifacts that can never be recovered, or the fact that you have to remove your shoes when entering the museum. (The joys of packing lite and bringing only snowshoes - I keep telling myself next month in Russia I'll probably be more thankful). In contrast, I'd never seen Tania so motivated - she was on a quest to collect all 11 stamps from stations around the castle in order to collect a free sticker! Since we were basically in Naha (albeit the eastern edge), we decided to head in and check out the city. Luckily, Naha has a monorail that goes straight from Shuri castle to the city center (we were so relieved to finally have access to a train system - although that might be shortlived considering I'm soon to take the Trans-Siberian). Well, sir, there's nothin' on earth like a genuine bona-fide electrified six-car monorail! We decided to alight at Kencho Mae monorail station, and walk down Kokusai Dori, the main street of Naha. Which turned out to be mostly back-to-back tourist gift shops (led astray by wikivoyage!). Some were more intense than others though - this one sold preserved Habu snakes! 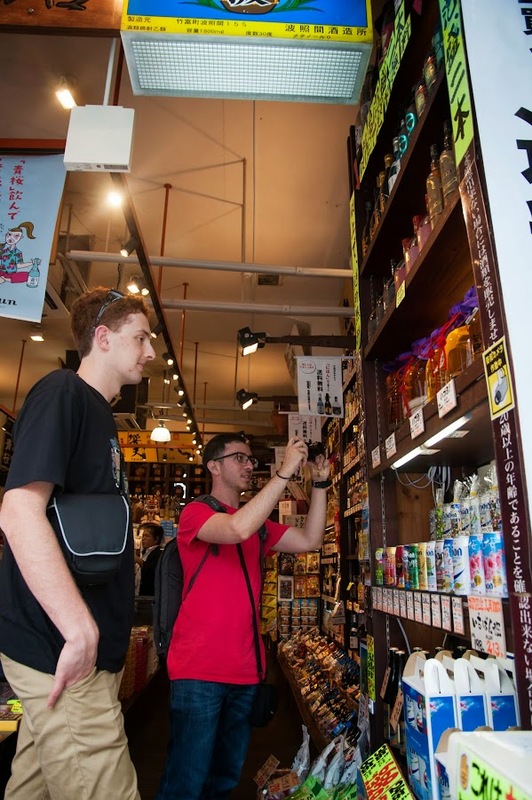 Halfway down Kokusai Dori however is the Makishi farmers markets; somewhat hungry, and trying to avoid McDonalds and/or Starbucks (the temptation was becoming too great, don't judge me), we decided to head over and check it out. Of course I couldn't resist more sata andagi. This time: coconut and plain sugar (B-, could have been fresher). And so that ended our day of exploring southern Okinawa-Honto; in anticipation of the gridlocked traffic out of Naha, we began our mad dash back, arriving just in time. Well, 7 minutes late. But almost! All in all, I drove 128km. We saw some awesome sights. And not only that, we managed to master the Japanese GPS system in our Honda. Perhaps our most impressive feat of the day?